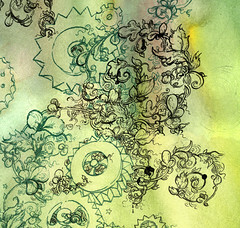 There was lots of names for the thing Ariadne made: computational flora, iGrass, memory trees, That Damned Stuff. There were lots of names for Ariadne, too, because when she got tired of nobody being able or willing to answer her questions, she just released Ariadne’s Meadow into the world. Fields began thinking, and forests began processing, and the world discovered that Ariadne’s Meadow was actually quite a nice place that just wanted to help. So much so that seven years later, when everyone discovered that Meadow probes had begun to break up Mercury, Venus and Mars for power, living space and computing strata, nobody really minded very much. Words by Warren Ellis, pictures by Molly Crabapple. 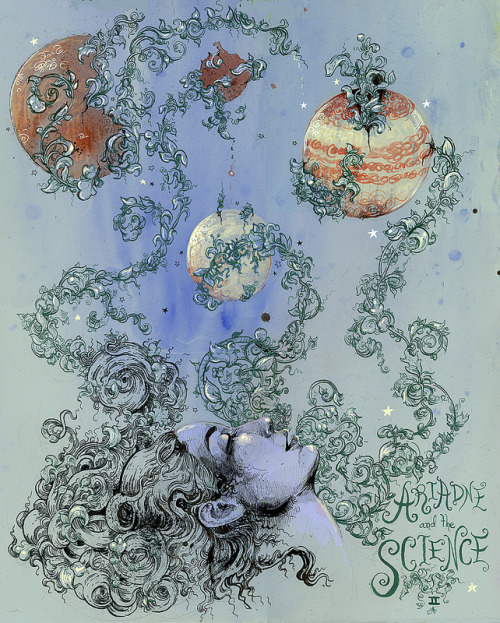 ARIADNE 2/5 is available as a limited-edition print. This entry was posted in Art on September 21, 2012 by Molly.